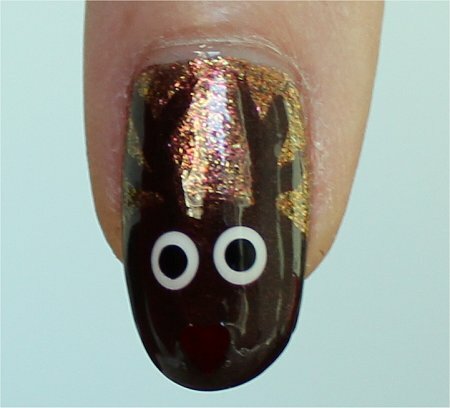 It seems like everyone’s doing Reindeer Nails (Rudolph Nails) lately, and since it’s a design I’ve never tried before, I thought there’s no time like the present! 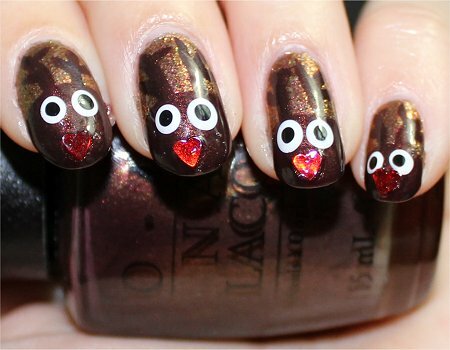 Also, I used red heart sequins for the noses because I wanted to do something different than just dots. This proved to be both a good and bad choice. 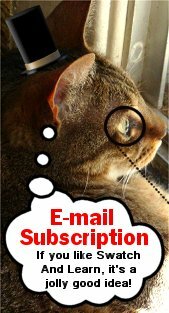 I’ll explain later on in my step-by-step tutorial featuring written instructions and photos. 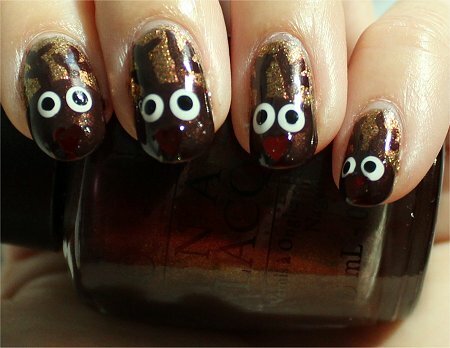 Antlers & Face: OPI Espresso Your Style! Flash – I know this is verrrry blurry, but I wanted to share this anyway because I liked how the heart caught the light. Looks like the nose is glowing. 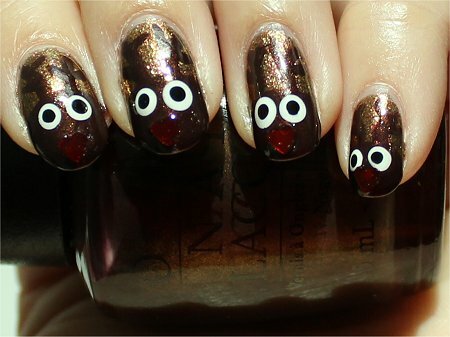 I chose OPI Warm & Fozzie from The Muppets Collection, which I went completely gaga for. 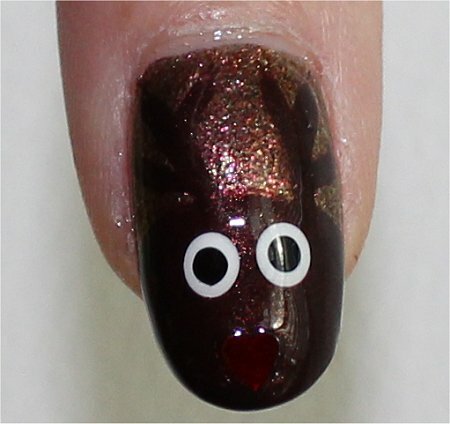 However, as I mentioned in my introduction to this post, it’s better if you choose a much lighter polish so that there’ll be more contrast between it and your reindeer. Using the brush right from your nail-polish bottle, cover slightly less than half of your nail. You may have to cover up the bottom of the antlers you just did, but that’s okay. Just be sure to leave the top ‘twig-like’ parts visible. Wait about 10 minutes before proceeding to the next step. You want this to dry a little. Add some white polish to your piece of foil and dip your dotting tool (or the end of a make-up brush handle, etc.) 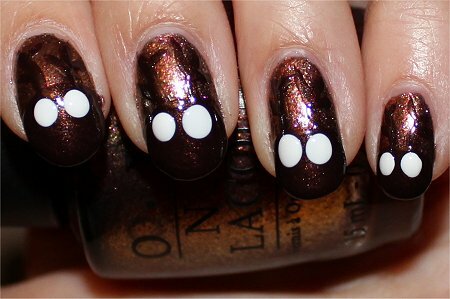 into it and carefully add two white dots on each nail. 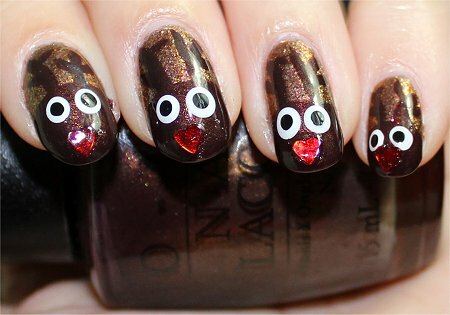 You could make these just regular reindeer, but I wanted to be festive, so I just had to add a red nose. And instead of using a dotting tool and putting on a red circle, I decided to bust out some nail sequins I had lying around. They’re red hearts. I placed them on by dipping the orange stick (it came in the sequin kit) into a bit of clear top coat and using it as the ‘glue’ to hold and pick up the sequins. Add some black polish to your piece of foil. Dip your dotting tool in it and create small pupils over the white dots. Feel free to play with the pupil placement – you can make them look at each other or be reindeer caught in headlights like mine! Wait a generous 20 minutes or more to allow all of this to dry more thoroughly. 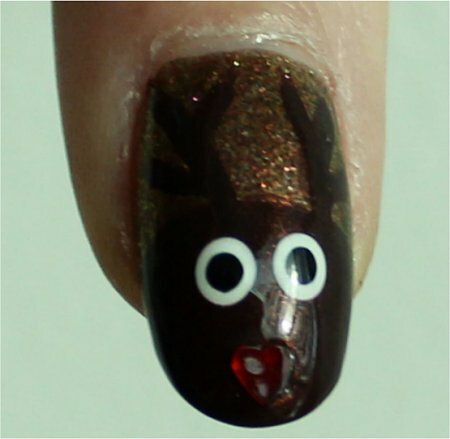 If you hurry now and put a top coat on, most likely, the pupils will smear badly, and we don’t want Rudolph to cry…unless he’s crying happy tears! In this final step, the top coat will flatten the design and pull the whole look together. It’ll also smooth out the sequins a little bit so they’re not as bumpy. Note about using sequins: One thing to note about using hard, inflexible sequins like I did is that on curved nails, they won’t lie flat. Also, the light will catch them all very differently depending on the angle. Keep this in mind. If you’re looking for a more uniform appearance, I suggest just using a red polish with a dotting tool. Plus, then you won’t have to be concerned about texture. Is Rudolph your favourite reindeer from Santa’s sleigh, or do you feel that another pulls your heartstrings? 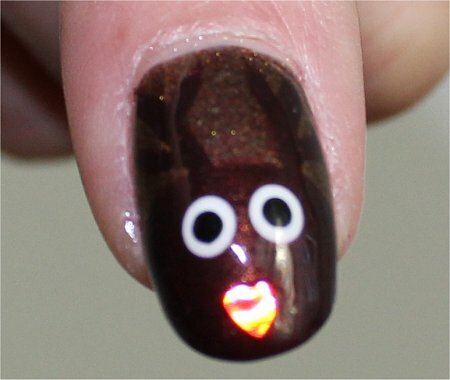 Do you prefer the look of these bumpy heart sequins for noses, or will you opt for a red dot? 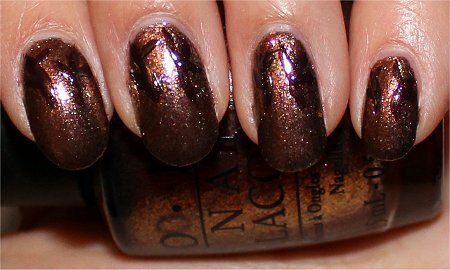 This entry was posted in Nail Art, Nail Polish Swatches & Reviews, Product Reviews, Tutorials & Tips and tagged ASP / All Season Professional, China Glaze, Cinapro, Daniel Stone, OPI on December 23, 2011 by Mary S.. I really like this manicure but I decided to wear the penguin nails for the last day of school so I just did them before reading this post. 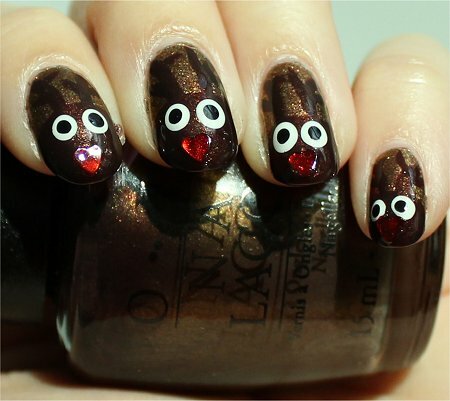 If only I waited a few more minutes, then I’d be working on this mani right now. 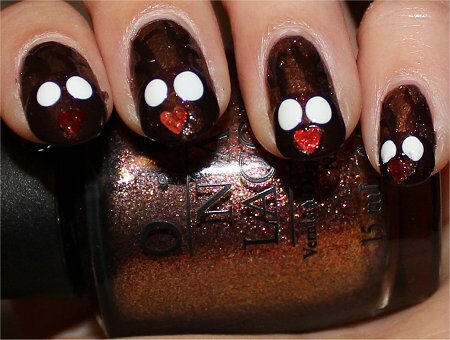 How did you like wearing the penguin nails? 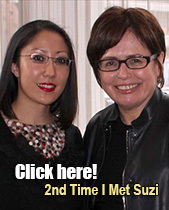 That design was one of my favourites, and it didn’t even take long to do – another plus! These are so cute 🙂 you always have the best nail art. His cute little nose adds the perfect touch to them! Aww…thank you so much for saying that! 🙂 The nose was a bit bumpy…hehe, but I’m a sucker for cutesy heart shapes. Conni recently posted: My Precious! Merry Christmas, Conni! Hope you have a wonderful holiday! 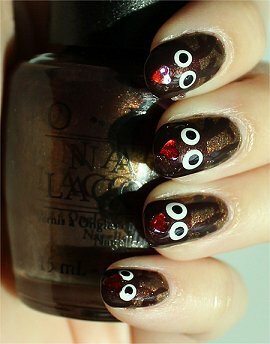 Cute take on this manicure – loving the heart-shaped red nose! YAY for bumpy heart-shaped noses. 😉 They’d look cute with little star noses, too, don’t you think? Great job! Are you going to keep them thru Christmas? 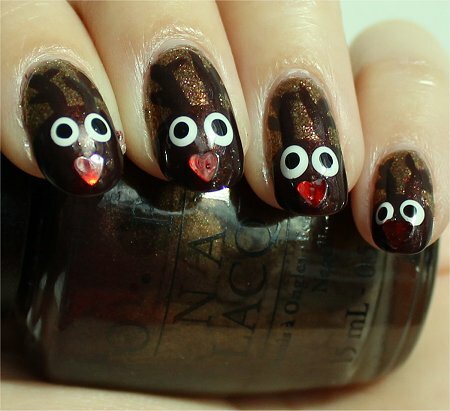 I’m glad that you shared my nail art with your co-workers! 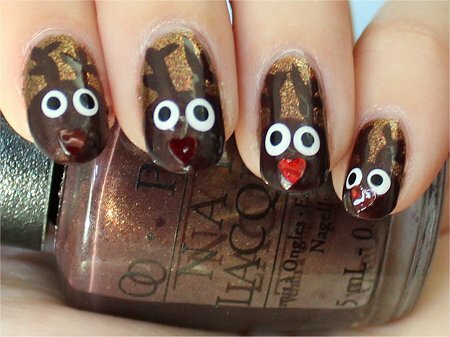 😀 Nail art should be shared and tried out by everyone…even men. Well, I don’t know how many men would try it, but…as long as something makes you happy and doesn’t hurt someone else, I think it’s all good. My nails…well, since my poor cuticles bore the brunt of all the stress of moving our office, I went light in the hopes that not too many people would notice them. I’m so disappointed that Pink Friday isn’t a holo. And I still haven’t seen it in person, either. 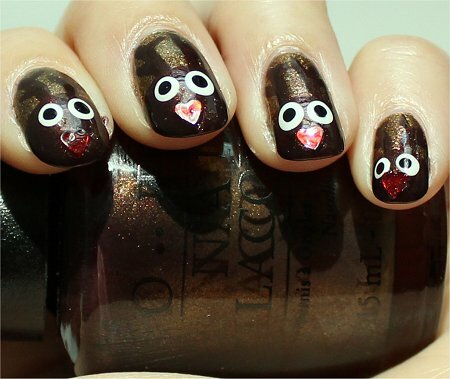 Ooohh, flamingo nails sound like so much fun. I should try it! Pink Friday might not be a holo, but Save Me definitely makes up for it by being absolutely loaded with long pieces of holo glitter and silver micro-glitter floating in a clear base. 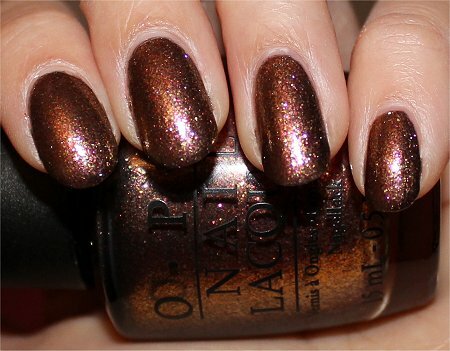 I was really hoping that they’d send you some before the release so that you could review them on your blog but it doesn’t look like OPI sent out much of anything for this collection because there are very few images available other than the company promo pics and those are never even close to being right. Definitely! Save Me is the one colour in the collection that I feel like I must have. It’s the star to me. It will be so cool to see what you come up with when you get Save Me. The whole time I was applying it, I kept thinking that someone with more artistic vision than me would probably find a really cool way to use it. Aww…thanks for thinking of me. 🙂 If I’m able to find it in the store, I’ll definitely have to play around with it and see what I can come up with. I don’t have any bar glitter polishes…at least, I don’t think I do. Nicole recently posted: Don’t cry children… it’s just a headless snowman. Look… I’ll put him back together!! The OPI Nicki Minaj line wasn’t supposed to break until January, but the Lori’s Giftshop in the hospital where I work got them in last week. What’s even worse is that the manager came to my office, knocked on the window to get my attention, then made that ‘painting my nails’ motion with her hands to let me know that new polish had arrived. Oh yes, a gold foil would loo so beautiful! You know, I almost was going to use one, but then, because I had previously fallen in love with OPI Warm & Fozzie, I changed my mind. Oops! 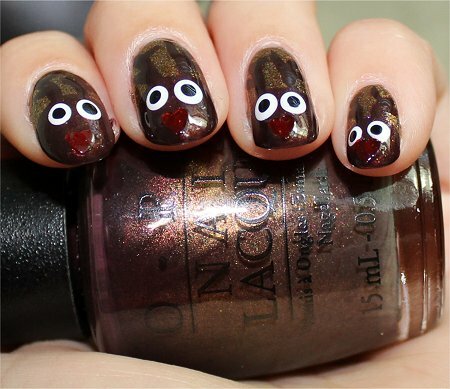 Yeah, I haven’t seen the Fingerpaints Flakies, either yet…or the OPI Nicki Minaj collection in stores. Although, I haven’t really looked for either and I just didn’t happen to run across them. 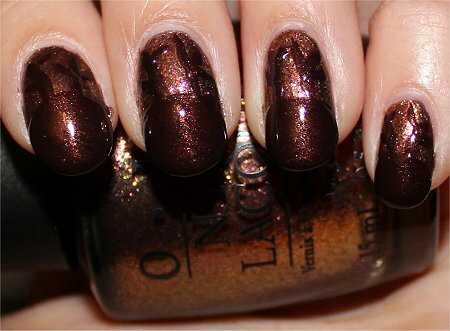 I really want OPI Save Me…beautiful! I like a few of her songs – they’re catchy. But I can only listen to her songs in small doses. Hope you like them. 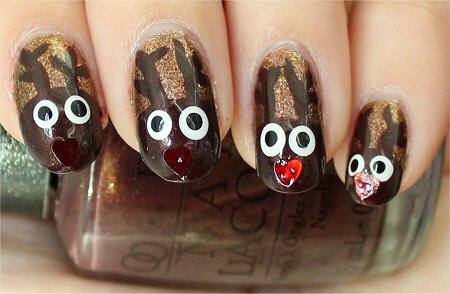 🙂 It was my first time trying out rabbit nail art – they could pass as cats with a little tweaking. You know, for the safety of these adorable little creatures perhaps it is a good thing that they are camouflaged a little! I would scoop them up and hug them!!!! Look at their shiny heart noses and beady little eyes! 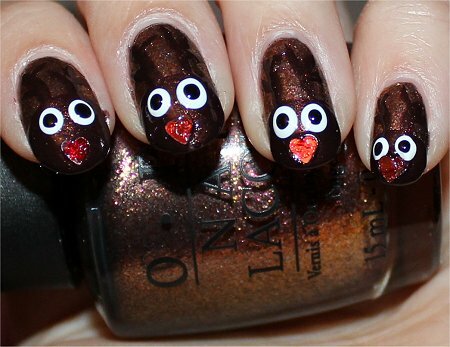 Another great nail art design Mary! Haha, the reindeer are now begging for your hugs!